At its core, search engine optimization (SEO) is about increasing your website’s visibility in the organic search results of major search engines. What types of content people want or need. How to properly promote and optimize your website. While search engines and technology are always evolving, there are some underlying foundational elements that have remained unchanged from the earliest days of SEO. This is why, in collaboration with some of the field’s top authorities and experts, we created this in-depth overview and tutorial – to define SEO for aspiring SEO professionals and explain how search engine optimization really works now. Today. Scroll down to start reading all 18 information-packed chapters – or, if you prefer, we’ve compiled all the chapters in a downloadable ebook, SEO 101: Learn the Basics of Search Engine Optimization. Are you an aspiring SEO professional? Then this is the guide you need to read. The basics of search engine optimization. What is SEO now, why it’s important, how people search and what they search for, how long it takes to see results, and some big challenges you’ll face in your career. Key ranking factors. Why links, keywords, and high-quality content are all incredibly important for SEO success. Also, we dispel some of the biggest SEO myths. How to continue your SEO education. Discover the top online search publications you should read, digital marketing conferences you can attend, and industry experts you should follow. The history of SEO. From the dawn of websites and search engines in the 1990s up to today, we recap the biggest milestones to help you understand where search has been, where it is today, and where SEO is heading in the future. EXPERT AUTHORS INCLUDE: Benj Arriola, Loren Baker, Anna Crowe, Dave Davies, Stoney deGeyter, Danny Goodwin, Tylor Hermanson, Ryan Jones, Jeremy Knauff, Julia McCoy, Brock Murray, Kristine Schachinger, and Dan Taylor. P.S.! 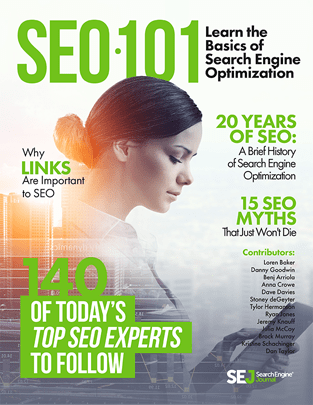 Once you’re ready to dive deeper into SEO, make sure to check out Search Engine Journal’s followup, A Complete Guide to SEO. It covers everything you need to know. 13.How Long Does SEO Take?